Technology is everywhere and comes to us and many shapes and forms. Children are exposed to technology from a very young age. I believe the first piece of technology they get their hands on is their parents' cell phone. Many educational toys and materials are interactive, produce sounds, and are colorful, gaining and maintaining their attention for longer periods of time. Once the child attends preschool there's even more technology accessible for them. In a preschool classroom you can find light tables, writing tablets, interactive games, smart boards, iPads, ebooks - the list is endless. As an early childhood teacher I'm always on the hunt for interactive applications for my students. My main criteria is cognitive development. I look for apps in which the student works on eye-hand coordination dragging from one side to the other, I look for catchy tunes and songs, and I look for problem solving opportunities. educational application for my students. 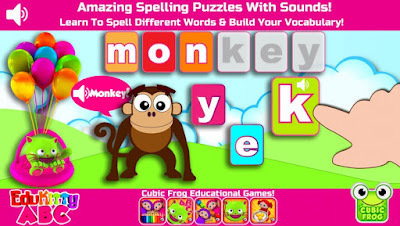 EduKittyEduKitty ABC from Cubic Frog. opportunities we must offer young learners. Learning to connect-the-dots teaches children sequence, exercise fine motor skills, spatial relationships, and cause and effect among other skills necessary for writing. Left to right correspondence is the beginning of early writing and emergent reading. It encompasses the correct mechanism of directionality. It is also the base for segmentation words and have reading success. Matching letter is a skill we work on regularly. Letter and word awareness is critical in early years. Matching letters involve problem solving, visual letter discrimination, and the ability to identify similarities and differences among letters.